Mindstrip is a trip from Berlin that has electronical elements combined with pop but has a bit of a dark atmosphere over them. The band formed in 2009. Their EP “Beautiful Liar” is out now. 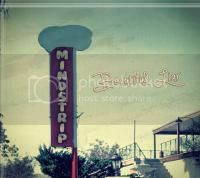 With an almost romantic drama Mindstrip opens this release. “Beautiful Liar”, the titletrack of this EP, is a song that has the softness combined with that drama and let you feel the pain of the situation as if it is happening right in front of you. Very sensitive and a perfect use of the vocals in combination with music. The second track is a less captivating but has the same elements in there. Then it goes up again with “Cold Like You”. The tracks are all quite slow. The band is currently working on a full length album and the question rises if the band is able to keep it interesting if you have to listen a full album by them. Would they have some more songs that stand out in such a way that you keep on listening? The four tracks the band gives are nice, the last track is a bit more dynamic which adds some more interest in it, but when it multiplies it may be a bit too much. Yet, the band shows they know how to make some gorgeous dark tracks, so perhaps we should just have faith in them.